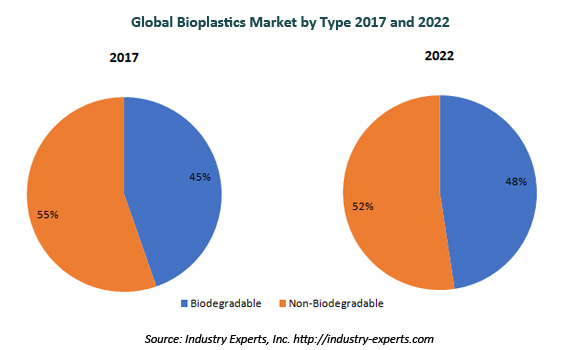 Packaging, Automotive and Textiles to Drive the Future Growth for Bioplastics to Reach 2.6 Million Metric Tons by 2022 – Market Report (2017-2022) by Industry Experts, Inc.
Industry Experts, Inc. unveiled an updated version of the global market report on Bioplastics. The new report entitled “Bioplastics – A Global Market Overview” reveals that the packaging is estimated the largest market sector for Bioplastics in 2017 with 1 million metric tons while the sector is also expected to register the fastest growth during the period 2017-2022. Depleting fossil fuel resources has made industry participants seek substitutes for conventional plastics and bioplastics are proving to be ideal alternatives to these environments degrading products, offering eco-friendly and sustainable options. Conversely, in comparison to traditional high-performance plastics, bioplastics have their own set of shortcomings, prominent among them being stability and strength. The plastics industry’s future lies in using plastic components obtained from renewable raw materials, and on an ecological scale, such bioplastics rank way above conventionally used petroleum-based products. Asia-Pacific accounts the largest regional market for biodegradable bioplastics with an estimated 351.8 thousand metric tons in 2017 (40.4% share), reaching 565 thousand metric tons in 2022. Asia-Pacific is also anticipated the fastest growing regional market with a robust CAGR of 9.9% during 2017-2022 period. Europe is estimated the second largest regional biodegradable bioplastics market with 31.8% share 2017. Global markets for bioplastics types/sub-types analyzed in this study include Biodegradable (Polylactic Acid (PLA), Polyhydroxyalkanoates (PHA), Starch Blends, and Others) and Non-Biodegradable (Polyethylene (PE), Polyethylene Terephthalate (PET), Polyamide (PA) and Others). The report explores the major applications of bioplastics comprising Packaging, Textiles, Consumer Goods, Automotive & Transport, Agriculture & Horticulture, Building & Construction, Electrics & Electronics and Others. This market report reviews, analyses and projects the bioplastics market for the period 2014-2022 globally, and the regional markets including North America, Europe, Asia-Pacific, South America and Rest of World in terms of Metric Tons. The regional markets further analyzed for 13 independent countries across North America – The United States, Canada and Mexico; Europe – Germany, France, Italy and The United Kingdom; Asia-Pacific – China, Japan, South Korea and India; South America – Brazil and Argentina. The report analyzes the Bioplastics market in the above regions by major country, product type/sub-type and by key application. This global market study includes 226 charts (includes a data table and graphical representation for each table), supported with meaningful and easy to understand graphical presentation, of market numbers. The report profiles 44 key global players and 52 major players across North America – 16; Europe – 20; Asia-Pacific – 15; and South America – 1. The research also provides the listing of the companies engaged in bioplastics industry. The global list of companies covers the address, contact numbers and the website addresses of 160 companies.